I've gone to the New Shimmer well once before but sometimes these things come around again. It's a cardigan and a pup tent! Presumably one size fits all? Boy asks: "Is it Eco-housing?" 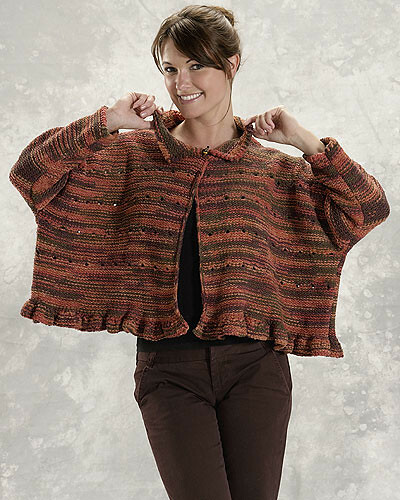 This is what happens when the knitwear designer drops her pattern binder, the patterns get mixed up, and she adds the sleeves from a child's sweater to the torso of a plus-size shrug, then puts it on a Size Zero model. It might look okay if she put her arms down. But who knows? Or Jeanne, maybe she ran out of ideas, and so she put a bunch of patterns in a blender and randomly pulled stuff out. Depends, does it have a name like Cardishrutent?